We first met Jolie Fay, the woman and mother behind Skipping Hippos ponchos back in early 2005 at one of those pre-etsy handmade craft extravaganzas in San Francisco, where we fell in love with the ponchos she makes for toddlers and promptly bought two. Then we bought a few more for just about everyone we knew with a little girl. They were perfect for the always-kind-of-cold, but never-too-cold weather of San Francisco. We saw her around at various craft fairs and she even named one of her poncho designs after our daughter [on sale!]. 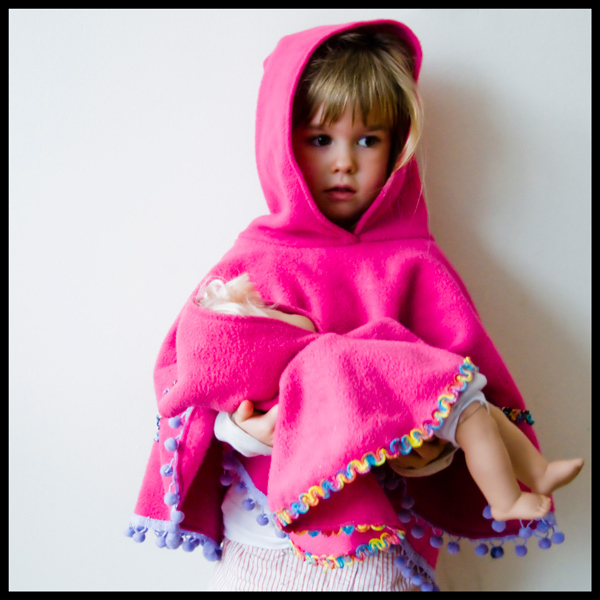 She recently e-mailed us to tell us that she was using the scraps from all the ponchos to make doll ponchos and wondered if Juniper would like one. It's one of the few "free offers" we've ever accepted and we're happy to write about her fine products here. And now Juniper's doll has a poncho just like hers. I'm also hoping to use this opportunity to suggest she start making boy ponchos, with very specific inspiration ["the Clint"].